Who is the couple in this photograph? 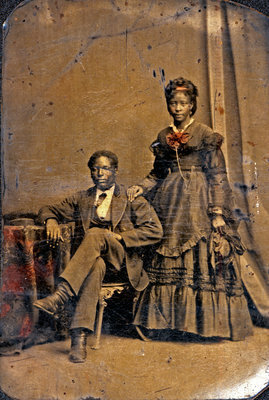 An unidentified African American man and woman are featured in this small black and white tintype photograph. The woman's headband and neck bow, along with the floral design on the tablecloth, have been highlighted in red. The name of the photographer and the location of the studio are unknown. This tintype was in the possession of Iris Sloman Bell, of St. Catharines, Ontario. Relatives of the Sloman Bell families are descended from former American slaves who settled in Canada.